Kansas City, Mo. (April 3, 2013) – MOSH Pit (Money for Organizations Saving Helpless Pits) Kansas City presents a fundraiser event, “Spring for a Pit Benefit”, featuring music from The Grand Marquis, Anthony Ladesich and The Johnstown Flood Band, The Filthy 13, Gentleman Savage, The PedalJets and Dolls on Fire on Saturday, April 13th at The Record Bar, 1020 Westport Road, Kansas City, MO 64111. Tickets are $8.00 each, with all proceeds to benefit MOSH Pit, which aids many Kansas City organizations, rescues and non-profits that help pit bulls and pit bull mixes. Raffle tickets will be available at the concert for $1.00 each; guests do not need to be present to win. All items will range from $25 to $200 value. Raffle items include a 39th Street food package, pairs of tickets to upcoming Kansas City events, artwork, gift cards and other packages. There will also be a silent auction for various items donated by The Pet Connection and others. Doors open at 6:00 p.m., and the event is open to anyone ages 18 and over. Bands begin at 7:00 and will perform 45 minute sets each. Tickets are $8.00 each and are available for purchase in advance on The Record Bar website at http://holdmyticket.com/event/133722. Tickets will also be available at the door the night of the event unless the event sells out. For more information about the Spring for a Pit Benefit concert, visit: http://www.facebook.com/events/146471698855616/. 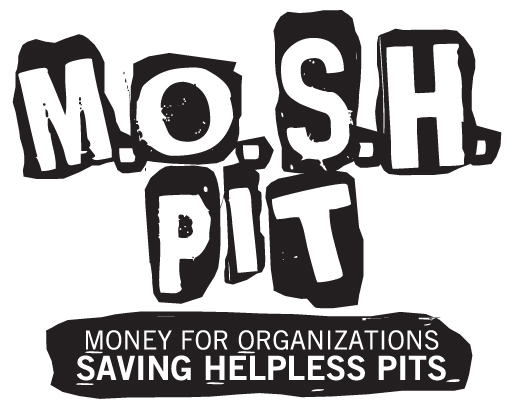 MOSH Pit (Money for Organizations Saving Helpless Pits) is a Kansas City-based all-volunteer group that assists rescue groups that help pit bulls and pit mixes in raising money for their organizations. MOSH Pit handles all of the leg work for fundraising events, from booking events, bands, and venues, to assisting in the collection of raffle items along with networking with area business owners and personal contacts to raise money for the rescue groups. Any rescue group with pits in their care can to ask for assistance by contacting MOSH Pit at moshpitkc@gmail.com, visiting their Facebook page at www.facebook.com/MoshPitKansasCity, or website http://moshpitkc.com.